A Children's Entertainer For Schools Has To Be Crazy Kris. 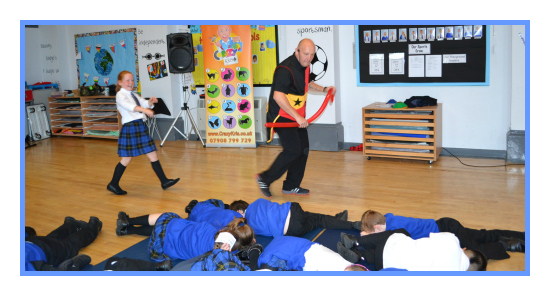 Chances are you will have different mixtures of age groups and you will be looking for a children's entertainer for your school that will captivate and entertain all. This what makes Kris stand out from the rest. Kris has worked in hundreds of schools around the north west. 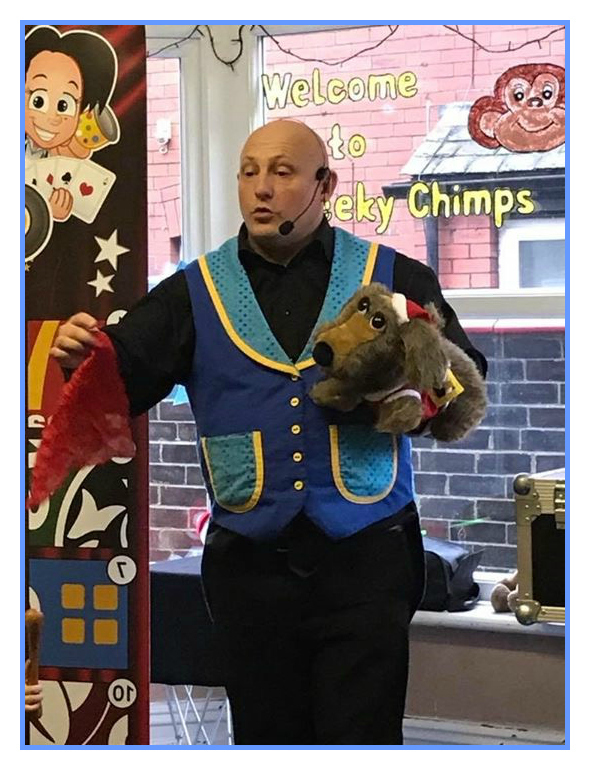 He can deliver a wide range of school magic show that gets everyone involved, the show is fast paced and appeals to a mixed age group to keep all engulfed from young to the old with Crazy magic and hilarious comedy. 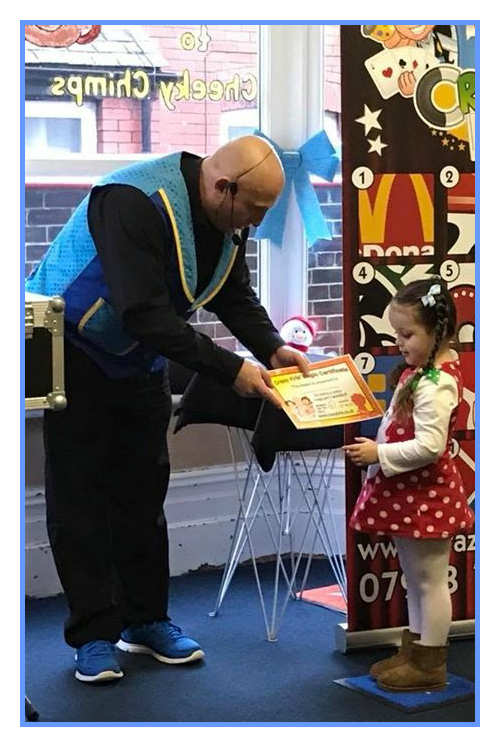 Kris performed a magic show for the children with additional needs then a workshop, everyone had a great time including myself! Kris can perform various entertainment for all ages. For instance ror the younger children there is lots of bright colours, high energy animated movement of puppets and the art of balloon modeling making all shapes and sizes of animals with magical interactive stories,. Kris is a professional working ventriloquist and has various talking puppets and group participation. The older children are blown away by the amazing Magic up to date magic that you see this day and age. The magic show alone is hilarious as they participate and become part of show having everyone involved. Crazy Kris loves being the school magician as the bigger the crowd the more fun the show is. This show is designed with bright colours, puppets, music and silly songs for everyone to join in. They forget where they are and totally feel relaxed and enjoy the show which they can all interact with. 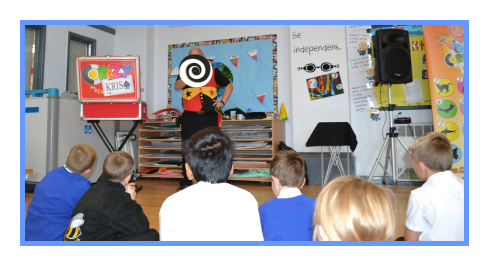 The pre-school magic show has been specially selected to appeal to the little ones. The children interact together making the magic work while Kris keeps they laughing all the way through the show. When you have seen Kris perform you will understand he is extremly value for money and this is why the schools come back to book him every year. I was so surprised how Kris kept there attention for so long for reception, Well done Kris I am impressed! We will definitely have you back doing the Christmas show! Crazy Kris is fully insured and members of Equity which gives you accountability and the peace of mind that you are dealing with professionals who will not let you down. A risk assessment is provided (on request) to suit your venue and we carry liability insurance and have a DBS certificate is available for inspection. He provides everything from back drops to a PA system; all you have to do is add the children and Kris will provide all the magic and entertainment. "All the staff have told me how CRAZY the show was and that you were brilliant with the children. Thank you so much and we will definitley be booking you for our Christmas family show and future parties." This package is ideal if you wish to do any fund raising, end of term parties, proms or any other special event you wish to organise. Kris keeps it running smooth from start to finish, from a magic show to start with then straight on to crazy party games with no elimination games and prizes too. The games involve team building, dancing games, silly forfeits and up to date prizes for all ages even the Teachers! "Our reception children did not stop talking about "Blue the puppet" all week , your show was very professional and kept everyone entertained from start to finish even the staff enjoyed the puppets! Thanks again Kris 🙂 "
All of the above have audience participation and gets the kids laughing and cheering for more. So what ever the type of school magician you require have a think about Crazy Kris' magic he can offer before booking anything else. The school magician show by Crazy Kris has to be the one you want with out a doubt. Just give him a call and see what this school magician can do for you.